I woke up today with a strange pulsing pain in the back of my head just a little above my right ear. 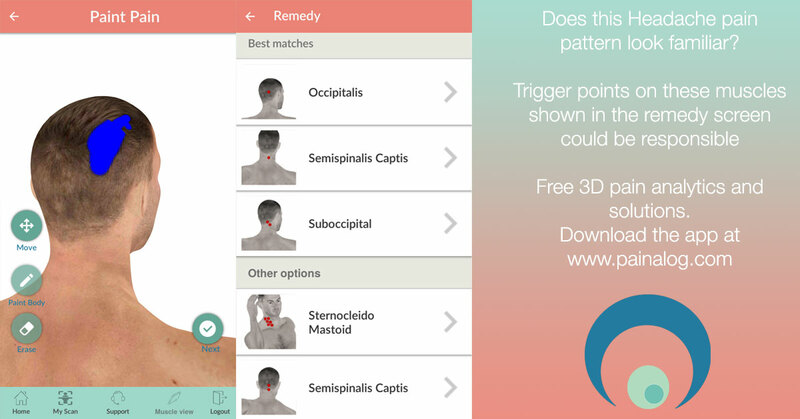 So I fired up my Painalog app and started a pain scan. Here are the results. Looking at this list and combining it with my understanding of posture and the work I do, I can say the problem is related to working on a desk with a head forward posture. Keeping the head forward and ahead of the shoulders is causing me to keep my Semispinalis capitis and Suboccipitals in a shortened state for a very long time. Of course, the sternocleidomastoid (SCM) is involved in the head forward posture too. This, in turn, has created trigger points on these two muscles. So for the next step I searched and palpated just at the join of my skull and sure enough, there was a huge bulge the size of a marble on a muscle that ran down the neck (the Semispinalis Capitis) and then several smaller knots just under the skull (suboccipital). To release the SCM I just gripped the SCM close to the mastoid process in a pincer grip. It instantly referred pain to the same spot and I knew I was doing this right. My next step is to pull out the ball and lie down on a mat and use the ball to release the Semispinalis Capitis and the Suboccipitals. Amazingly the pain is gone and I feel a lot better. You can access the solutions for each of these muscles from the links above. Though I would recommend that you download the app for free get your own custom report.